You ever drive down Sharon Road and ask yourself, "Who the hell is Sharon anyway?" WHAT'S IN A NAME? : Named after a tobacco big-wig's wife, Elizabeth Avenue started off as a dirt road leading here to Elizabeth College. Well, we -- the editors and writers at Creative Loafing -- asked ourselves that very question. We wondered about the secret identity of Sharon ... and of Elizabeth, Wilkinson, Mint and a host of Charlotte's other city streets. Call us geeks. Sure, maybe we have way too much time on our hands, but we can't be alone in our musings. So, for those other folks out there with a nose for historical facts, we've tracked down a handful of tales explaining the origins of the roads you travel down every day. Driving down Wilkinson Boulevard today, one gets little hint that this thoroughfare was once the pride of North Carolina's road system. Before the advent of the U.S. interstate system, Wilkinson Boulevard was the widest, most-traveled route in and out of Charlotte. Indeed, Wilkinson was the first four-lane paved highway in the state when it opened in 1926, says Tom Hanchett, historian at the Levine Museum of the New South. In 1921, Gov. Cameron Morrison charged a new state highway commission with building roads with proceeds from a mind-boggling $50 million bond issue. The program gave North Carolina the reputation as the "good roads" state. "They didn't have anything like that in the South," Hanchett says. "That's one of the reasons why Charlotte is what it is and why North Carolina is what it is ... the state decided to tax itself and build highways at a point when that was a rare thing to do." Wilkinson stretched from Charlotte, where mill owners and businessmen who served the mills lived, to Gaston County, which Hanchett says "had more looms and spindles than any other country in the world." No surprise then, that the man at the helm of the commission was William Cook Wilkinson, a Charlotte banker and textile mill owner. Wilkinson started working at Merchants and Farmers Bank at age 16. By 1919, he was bank president. He also was president of the Lowell Mills. A 1939 Charlotte News article explained the boulevard's moniker this way: "By reason of its exceptional construction and the community's high regard for the commission, the highway was given his name." The Beatties Ford Road name has carried such historical import among some Westside residents that many haven't wanted the three-mile road, which stretches through a predominantly black neighborhood, renamed after Dr. Martin Luther King Jr.
At least twice -- in 1976 and 1990 -- according to reports in the Charlotte News and the Charlotte Observer, city planners have considered such a proposal. Each time, it has been discarded with the exhortation to find a better street to honor King. Beatties Ford Road, home to institutions like Johnson C. Smith University, the Excelsior Club, West Charlotte High School and the city's first United House of Prayer for All People, hasn't always been associated with west Charlotte's African-American community. The road was named for John Beatty, an early landowner, according to Tales from the Hornet's Nest, by W. Hugh Harkey. A Scotts-Irish pioneer, Beatty was believed to be the first European to cross the Catawba River. Some of the earliest European settlers followed, building farms and plantations along Beatties Ford. The road later became a vibrant epicenter of west Charlotte. But later, at its worst, the road's reputation was blemished by crime and decay. This February, Charlotte finally joined the legions of other cities in naming a street after King. The City Council voted unanimously to rename Second Street. And Beatties Ford Road has retained its historical name. THE CENTER OF IT ALL: Before this intersection was Plaza and Central, it served as the crosspoint of Plaza and Lawyer's. Elizabeth Avenue started out as a humble dirt road leading to Elizabeth College, a Lutheran women's college named after Anne Elizabeth Watts. Tobacco big-wig Gerald Watts fronted the cash for the impressive two-story brick building (present-day location of Presbyterian Hospital) named after his wife in 1897. Despite the somber Victorian era, Elizabeth College emerged as a vibrant campus. The Charlotte-Mecklenburg Historic Landmarks Commission states that the college frequently hosted concerts, and cheeky pictures posted on the CMHLC Web site show Elizabeth College girls posing with basketballs, flirty smiles and (gasp!) showing bare arms. Eventually, the dirt road was paved, and Elizabeth Avenue was born. In the 1900s, Elizabeth Avenue was the place to be. 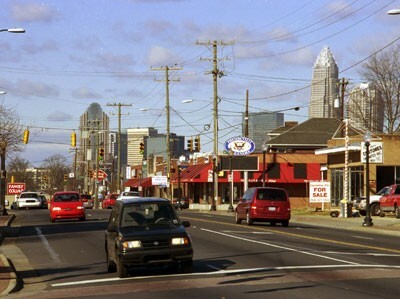 Elizabeth became the first suburb on the eastern side of Charlotte, following the trendy Dilworth on the southern side. In 1903 a trolley line was built, connecting Elizabeth Avenue and Hawthorne Lane to the city's center, and Elizabeth Avenue experienced a residential boom. Most of the city's upper crust could be found real estate shopping on Elizabeth; among those were department store mogul William Henry Belk (yes, that Belk) and several prominent city leaders. In later years, Elizabeth was the home of humorist and writer Harry Golden; his buddy Carl Sandburg was a frequent visitor to his home and to the bustling avenue.